Luftwaffe 7,65mm Pistol Holster for the FN Browning Model 1910/22 Pistol (Nur für lange Browning-Pistole Kal. 7.65). 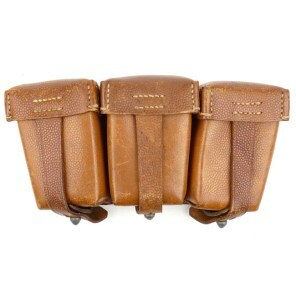 The holster is nicely maker marked and dated with 'jhg 43', the leather is still very supple. Nice example in good used condition! 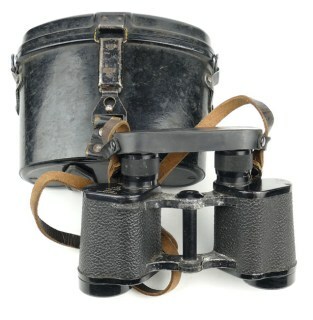 Standard Wehrmacht binoculars 'Dienstglas' 6 x 30. Maker marked with 'cxn' indicating production by the company of 'Emil Busch AG' from Rathenow. 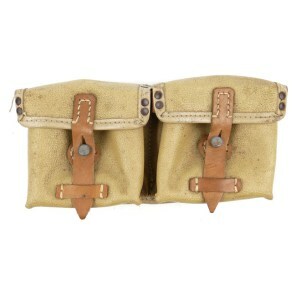 The binoculars are complete with leather carrying strap, anti-movement flap and bakelite lens cover. A nice and honest piece of equipment! WH (Heer) Medical/Mountain Troops M31 Canteen and Cup (Feldflasche 31 und Trinkbecher). This is a so-called 'Labeflasche' with a 1 liter capacity, complete with aluminum cup. The canteen is maker marked and dated 'G&C39'. Nice original canteen in very good condition! This is a nice chocolate-brown coloured Wehrmacht (Heer/Luftwaffe) K98 Ammo Pouch (Patronentaschen). 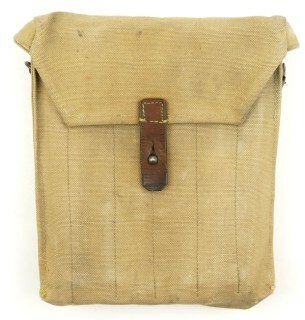 The pouch is nicely marked by the company of 'Stecher' from Freiberg and dated 1937. The pouch is complete with all partitions. Nice original example in very good condition! Luftwaffe M31 Bread Bag (Brotbeutel 31). The breadbag has the nice blue-grey Luftwaffe colour as it should be. The breadbag is not visible maker marked or dated. Nice example in good used condition! 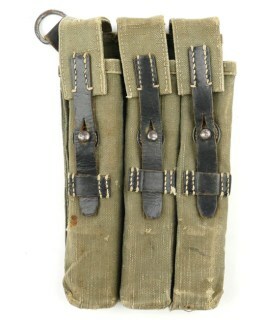 WH (Heer) K98 Ammo Pouch (Patronentaschen). Nice mid to late war example made of blackened leather. The pouch is nicely maker marked and dated 1941. The pouch is complete with all partitions. Nice original example in good used condition! 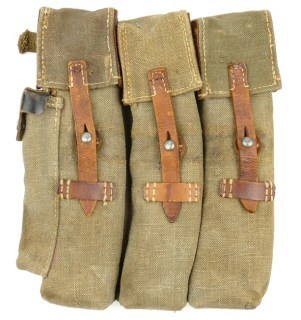 WH (Heer) K98 Ammo Pouch (Patronentaschen). Nice mid war example made of blackened leather. The pouch is nicely maker marked by the company of 'H.Kruse' from Lübeck and dated 1941. Nice original example in good used condition! This is a nice original blackened leather K98 Bayonet Frog (Seitengewehrtragetasche). The frog is nicely maker marked by the company of 'Wittkop & Co' from Bielefeld and dated 1936. Nice original frog in good used condition! Nice original German Flare Pistol - 'Leuchtpistole 34' (LP34). Nicely maker marked with manufacturer's code 'S/237' and dated 1938. This is a functional flare gun, exempted by the Dutch law in Article 18, paragraph 1, in d, annex II of the Rwm. Sale only to persons above the age of 18! 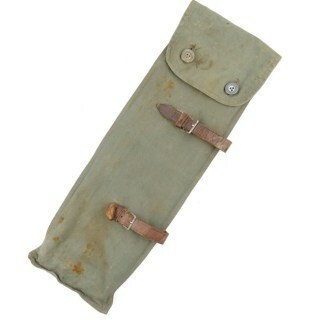 This is a nice original all webbing construction tropical K98 Bayonet Frog (Seitengewehrtragetasche). The frog is not visible maker marked or dated. The frog is complete with horizontal retaining strap. Nice original example in very good condition! K98 Combat Bayonet (Seitengewehr 98K). Non-matching example as found together, the late war bayonet is maker marked and dated with 'cof 44', it comes with an early scabberd which is maker marked by the 'Gebr.Heller' and dated 1937. Nice bayonet in good used condition! German 'Feuerwehr/Feuerschutzpolizei' Dress Bayonet (Extraseitengewehr). The blade is in good used condition, the blade is nicely maker marked by the company of 'Eickhorn' in Solingen. Nice example in good used condition! WH (Heer/Luftwaffe) M35 Map/Dispatch Case (Meldekartentasche M35). The light-brown leather map case is nicely maker marked by the company of 'A. Waldhausen' from Köln and dated 1938. Nice example in very good, near mint, condition! 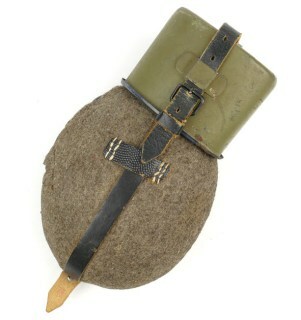 This is a nice light-brown coloured Wehrmacht (Heer) K98 Ammo Pouch (Patronentaschen). The pouch is nicely marked by the company of 'E.O. Götze & Sohn' from Gersdorf and dated 1940. The pouch is complete with all partitions. Nice original example in very good condition! 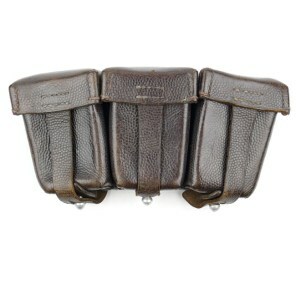 G43/K43 Ammo Pouch (Patronentaschen G43/K43). Nice example made of 'Ersatz' material, with brown coloured leather parts and having fieldgrey webbing belt loops, nicely maker marked and dated 'ros 1944'. Nice original pouch in very good condition! Set of 3 Gas Warning Flags (Gasspürfähnchen). 3 original flags on poles, the flags are in good used condition. 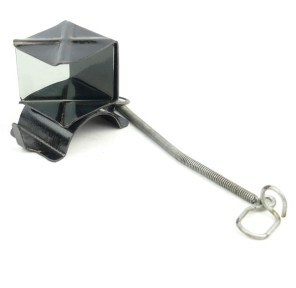 Perfect for completing your gas warning flag set if you're missing a few flags. Nice flags in good used condition! 'Ersatz' type pouch for the gas warning flag set (Gasspürfähnchen). The black simulated leather pouch is nicely maker marked by the company of 'Gustav Schiele' from Loburg. The pouch is complete with webbing carrying strap. Nice original 'Ersatz' type pouch in used condition! Wehrmacht Panzer Model 'B' Throat Microphone (Kehlkopfmikrofon). 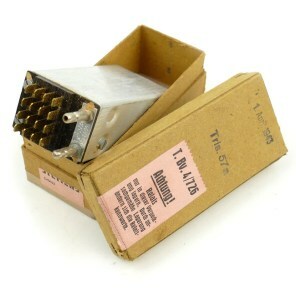 The set is complete with it's original wire and plug. Nice complete set in good used condition, hard to find piece of equipment! 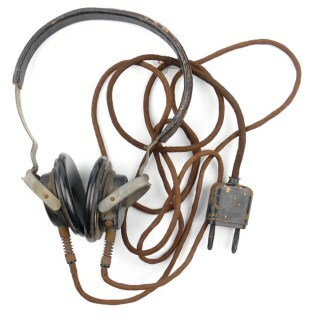 Wehrmacht 'Dfh.a' Headphone (Doppelfernhörer). Example is marked with '44' indicating production in 1944. The headphone is complete with it's original wire and plug. Nice piece of equipment in good used condition! 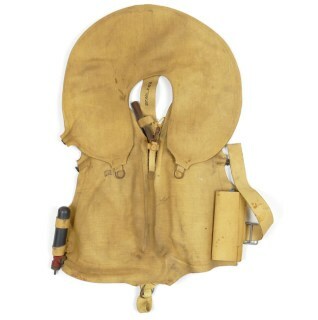 WH (Heer/Luftwaffe) 7,65mm Pistol Holster (Pistolentasche) as most likely used for a 7,65mm Pistol. 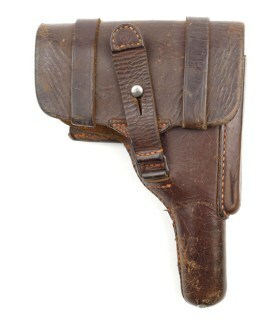 The holster is made of late-war 'Ersatz' material, the holster not visible maker marked or dated. Rare original example in used condition! This is a nice Wehrmacht Tent Pole Bag M15 (Tasche für Zeltausrüstung). The pouch is nicely maker marked by the company of 'Greve & Guth' from Gütersloh and dated 1940. Nice and hard to find original pouch in good condition! K98 Combat Bayonet with Frog (Seitengewehr 98K mit Seitengewehrtasche). Matching example, the bayonet and scabberd are both marked with number '287' and maker marked by the company of 'F.Herder' and dated 1938. Nice example in good condition! Wehrmacht K98 aim corrector (Zielkontrollapparat). The aim corrector was mounted to the rear sight and is used for instruction during dry fire excercises. The aim corrector is nicely 'D.R.G.M.' marked. Rare original example in very good condition! M38 Gasmask with Canister (Gasmaske M38 mit Blechbüchse M38), complete with three pairs of Klarscheiben, cleaning cloth & retaining spring and both carrying straps. The canister is dated 1940. Nice original set in good used condition! This is a nice set of two original Wehrmacht Bakelite Tent-herrings (Zeltpflöcke). The herrings are nicely maker marked and dated 'GS 41' indicating production in 1942. Nice original tent pegs in good used condition! This is a nice Wehrmacht M31 Canteen and Cup (Feldflasche 31 und Trinkbecher). Green painted enamelled steel canteen, complete with enamelled steel cup. Nicely maker marked and dated with 'AEM.A.43'. Nice original canteen in very good condition! This is a nice late war Wehrmacht M31 Canteen and Cup (Feldflasche 31 und Trinkbecher). Red painted steel canteen with gabardine cover, complete with bakelite cup. The bakelite cup is nicely maker marked and dated 1944. Nice original late war canteen in good condition! This is a nice M31 Canteen and Cup (Feldflasche 31 und Trinkbecher). This is a pressed wood, so-called “coconut”, covered aluminium flask, complete with aluminum cup and webbing straps. The canteen is maker marked and dated with 'H.R.E.42'. Nice original canteen in good used condition! WH (Heer/Luftwaffe) M35 Map/Dispatch Case (Meldekartentasche M35). 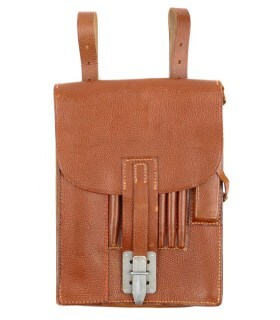 The chocolate-brown leather map case is in good used and complete condition, see photos. The map case is dated 1939. Nice example in good used condition! Standard larger type Wehrmacht 7x50 binoculars (Doppelfernrohr). The binoculars are not visible maker marked but look period correct. The binoculars are complete with leather carrying strap, anti-movement flap and bakelite rain-cover! 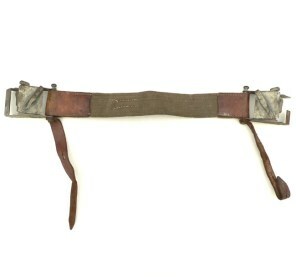 MG34/42 Carrying Strap (Trageriemen). 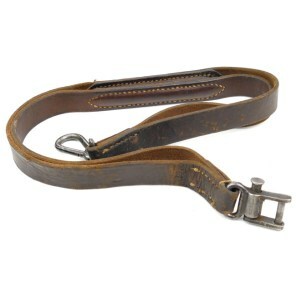 The brown leather sling is nicely maker marked and dated 'erg 43' indicating production in 1943, the strap is WaA marked as well. The leather is in good supple condition. Nice original carrying strap in good used condition! 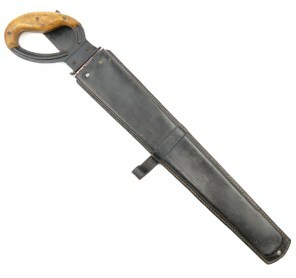 K98 Leather Sling (98K Trägeriemen), complete with leather retaining tab. Regrettably the leather is in fragile condition, see photos. It can still be used for display. Hard to find sling in used condition. This is a nice 'Technische Nothife' (TeNo) Tent Pole Bag M15 (Tasche für Zeltausrüstung). The pouch is nicely marked with the TeNo logo. Nice original pouch in good used condition! MG 34/42 50 Round Drum Magazine (Gurttrommel 34). 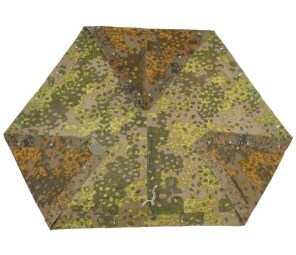 The drum retains most of it's original fieldgrey paint. The box is nicely maker marked and dated 'wc43' indicating production in 1943. Nice example in good used condition!